There are a few deadlines that everyone knows by heart. People may forget their spouse's birthday or their anniversary, but no one forgets the day that federal income taxes are due. Still, many people file for extensions, putting the inevitable off as long as possible. Even after an extension to October is granted, people still don't do much work and instead, wait until September to really get rolling on this project. 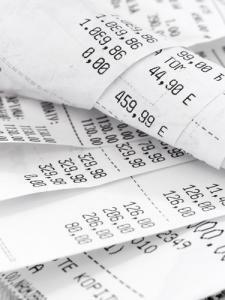 For most, the piles of receipts continue to grow and little is done until the very last moment. It is just human nature to procrastinate, even though frequently the amount of work is the same or worse than doing the task on time. Speaking of the future, this coming October also marks the beginning of a new era for bank cards. One could argue that there has also been a strong procrastination element to this implementation as well. As bankers know, by October customers will get new sophisticated microchip cards and the fraud risk shifts to the business if they don't have the ability to use the security features of the new cards. We bring this up because we know some bankers are still discussing this change. There are basically two choices for card issuers when all is said and done - chip and signature or chip and PIN. At a base level, chip and signature cards will be sufficient to avoid liability in the case of fraud, but it seems to be a somewhat short-sighted fix when the quantity of card fraud has grown so much. Further, card companies have long known that PINs are more secure but have procrastinated, citing concerns about customer preference and convenience. Bankers will have to find a balance that works for customers and works for the bank, so discussions continue. The result of the reliance (until now) on signatures, is that the US is home to 50% of all card fraud worldwide, yet we only account for 25% of card transactions in the world. Certainly the upcoming deadline for new chip cards should be a turning point, but experts doubt the implementation will be completed by the deadline. In fact, the Smart Card Alliance estimates that by the end of 2015 only 70% of the credit cards issued will be EMV cards and the numbers for debit EMV cards will be worse, around 40%. You might also be interested to know that the Payments Security Task Force studied the 8 largest card issuers. It projected that about 63% of cards will have chips by the end of 2015 and it will take another 2Ys for 98% of cards to be compliant. Javelin Strategy and Research analysts predict it could take even longer. They project it will take until 2018 for 96% of credit cards and 98% of debit cards to be reached. Worse still, the Payments Security Task Force forecasts only 47% of smaller merchant terminals will be ready by next Christmas, so more work remains to get there. Community financial institutions can use this transition period as an opportunity to get in touch with customers. Use the time to help people understand the change, find out what they might need and let them know EMV makes their transactions more secure. It's not every day that bankers have a good reason to talk to every customer - business or retail - so take the opportunity and engage. As you do, be sure to let them know what you are doing with EMV to protect them and to illustrate other opportunities you may have for them. Now is the time, so don't procrastinate! Treasury yields fell just under 2bps as CPI data came in slightly lower than market expectations. It should be a relatively quiet day for the market as there are no significant economic releases scheduled. 1) Centennial Bank ($7.5B, AR) will acquire Bay Cities Bank ($541mm, FL) for about $101.6mm in cash (20%) and stock (80%). 2) First Republic Bank ($51B, CA) will acquire Constellation Wealth Advisors LLC for about $115mm. Constellation provides high net worth individuals, families and family foundations with strategic investment advice as well as asset allocation. 1) The Havana National Bank ($215mm, IL) will acquire a branch in IL from The First National Bank of Barry ($118mm, IL) for about $1.4mm. The branch has $8mm in deposits. 2) Royal Bank America ($721mm, PA) will acquire a PA branch from First CornerStone Bank ($115mm, PA) for an undisclosed premium. The branch has $39.3mm in deposits and about $6.2mm in loans. The bottom line from the Fed at this point is that the number of governors projecting a single rate increase this year has increased from 3 in Mar to 7 now. In addition, 15 were in favor of a rate hike this year, while 2 preferred to wait until 2016. Taking this all together, it appears a rate hike is likely this year, but at a gradual pace. Chair Yellen seemed to reinforce this theme with the comment, "No decision has been made by the committee about the right timing of an increase, but certainly an increase this year is possible." Best guess - look for the training wheels to come off in Sept. The CFPB will delay the effective date of TILA-RESPA integrated disclosures for home purchases until Oct 1 in order to provide additional time and better accommodate the interests of consumers and providers busy buying homes in the summer months. The FDIC has proposed reducing assessment fees for community banks below $10B in assets that have been insured for at least 5Ys. Under the proposal, this group would go into effect 1 quarter after the DIF reaches 1.15% (currently at 1.03%) that would result in about 60% of community banks paying lower premiums. Larger banks would pay a separate assessment that would take the DIF to 1.35% by 2020. The Fed now projects GDP for this year will be 1.8% to 2.0% vs. the 2.3% to 2.7% range projected in March. A Harris Poll finds 46% of people make banking transactions on their smartphone in their bedroom; 30% have done so in the bathroom and 13% said they had done so while driving. Also interesting, 20% of Millennials said they had made a mobile banking transaction at a bar or while driving.